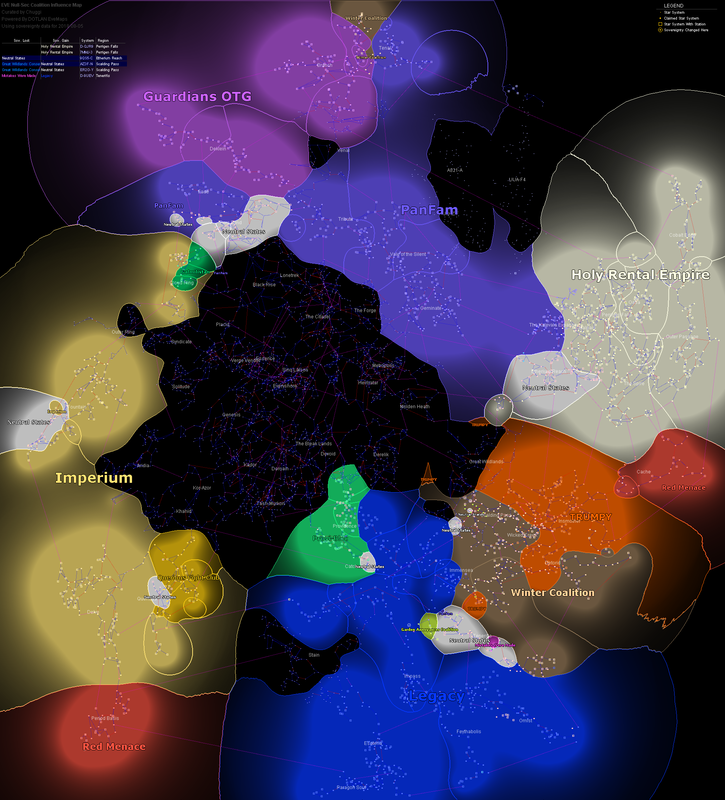 I can remember a time when I was really interested in corp- and alliance-level politics in EVE Online. That time is past. Hell, I find it increasingly difficult to worry about it even as it applies to myself. Prior to my current corp, I've been in seven corps in EVE. Of those seven, I can only name the CEO of two during my time with them with any confidence (sorry, guys!). Most of those corps were in alliances -- five in all -- and I do better with alliance leaders. I can name three of the five. But two out of those three were (again, sorry!) non-entities in the grand scheme of things, beholden to coalition leaders. As a result, the alliance leaders would get their marching orders from the coalition leaders and then tell the alliance membership directly what was going on. If the corp CEOs got involved at all, it was -- at best -- a message saying "Yeah. What he said." This doesn't mean I don't remember members of past corps and alliances -- I do, of course! And chances are pretty good that several of the pilots I remember were CEOs of the corps I was in, or leaders of alliances. I just don't remember that they held those positions because from a leadership standpoint, they were non-entities. There are certainly exceptions! Seleene and the members of Body Count Inc. are hugely proud of their corp. Members of a few other PL corps feel the same. Marcel Devereux and the members of Aideron Robotics are, perhaps, even more so. (1) And in some alliances, there are certainly back-and-forth discussions about how this corp is better than that corp. But these are the exception rather than the rule, I suspect. It's been joked that Brave Collective and its members are experiencing the EVE meta-game at a hugely accelerated rate. And they've cemented that impression with the formation of their own coalition and the invasion of Catch. And now increasingly, you hardly hear about BRAVE any more; you hear about H.E.R.O instead. It wasn't always this way, of course. As I said, I can remember a time when I was really interested in alliance-leader politics in particular. So much juicy drama! I had fun researching it and reading about it, and any regions I wasn't interested in, (the now departed from EVE) Mord Fiddle was. (2) These days, what little drama is left seems to be reserved for coalition leadership squabbles and as the number of coalitions dwindles, even that is draining away. So it is with some amusement that I read about the collapse of both Gentlemen's Agreement and Li3 Federation, and the formation of The Bastion alliance. The new alliance apparently recognizes that any leadership decisions it makes mean so little that they are not even bothering to select a leader as such. They just declared CFC coalition leader The Mittani to be their leader and will apparently just pick a few people here and there to interpret and communicate that gentleman's directives for those corps that choose to join them from GENTS and Li3. Plus, you know, maybe find a person to pay sov bills for a couple of systems or perhaps fuel a jump bridge or two. As alliances and coalitions grow, what we increasingly see when one fails is that rather than a successor step in to take over, the resulting leaderless organization is either peaceably folded or merged into a healthy organization... or it collapses from internal rot, a vacuum is created, and the healthy organizations move in to fill it. Either way for New Eden, the size of the resulting organizations grows and the number of leaders shrinks. And as a side effect, becoming one of these leaders becomes more complicated. That makes it even less likely that someone will be able or willing to step up to fill the newly-expanded role! Quite a vicious circle! Sooner or later, though, one of these high-level coalition leaders is going to burn out, rage-quit, or just walk away. Should be interesting to see what happens when that day comes! In the meantime, I can't help feeling that New Eden is becoming a less interesting place. (1) These guys were nice enough to give me one of the corp challenge coins they had made at this year's Fanfest. Thanks, guys! (2) This was before he was all grr Goons. Again, sorry to see you go, Mord. Legion of Spoon have a very rich Corp culture, and we only take orders from our Corp CEO. It's taken you this long to 'feel' that New Eden is becoming a less interesting place? Jester has admitted he's a victim of BitterVet. However, now that he's not a CSM member anymore, it will be interesting to see if one morning he wakes up and says "Gods, what a waste of my life." and walks away without looking back. @Anom 12:06. Ripard as I understand it is right now in Provi space. If the shift of the majority of industry happens as expected, Provi systems may end up being as valuable to an industry based corp as any other null sec area. Provi has a LOT of stations already built. Let's see what he thinks of the direction of Eve if one of the big coalitions comes calling on Provi and says "nice systems, think we will take them." LAWN was always terrible either way. I'm an eve newbie and I guess I got lucky by joining a corp I really like. I would not join a corp like the ones you mentioned who was only there to be an alliance member. I was thinking the same thing as I wrote the post. I almost cut the two corp links and the alliance link, but I wanted to make sure it was clear to what I was referring. I'm pretty certain that even if the Goons failed and were replaced by some other null sec coalition that Mord Fiddle would still be leaving Eve and the reason he gave would still be fully valid. Grr Goons isn't an accurate summary of his position. Didn't say it was. But I didn't want anyone teeing off on Mord talking about alliance drama only because he was interested in it for the grr Goons. That's why that was a footnote. i have a lot of respect for Mord .. and his departure weighs heavily upon me. I'm going to be a member of this new alliance, The Bastion. I think it's worth mentioning that the leader isn't just going to be Mittens's messenger boy, it's Carneros who's a bit of a diamond. I left Li3 rather bitter at much of its leadership but not at Carneros. Simply put no one dislikes him, he's one of life's diplomats and that will be crucial in The Bastion. Now at the moment one of two things could happen with The Bastion. It could simply be a dumping ground for failed, leaderless. CFC trainwrecks full of bitter and demoralised pilots who've just watched their alliance fall apart in apathy. What we're hoping however is that we can get people to buy into the Rapid Reaction Force concept and have pilots aggressively deploying all over New Eden. That will work only if deployments are well chosen, fleets are exciting, doctrines are accessible and enjoyable to use and all the admin stuff like SRP gets handled smoothly (it probably will - Goons are handling our admin stuff). The leadership to make that happen won't simply come from Mittens, he's too remote and too busy with other stuff. If it does do well it will do well because of Carneros and his FC team, there's a lot of hands on leading to be done. It isnt a big group but rumor has it that kelduum wants to come back to euni and take over again. Its a product of a broken sov system those of is living in high and low have no idea what your talking about? If u live in 0.0 u either PL or a goon right? Came expecting to read about the Post-leadership CSM, what with the latest council abolishing titles and official positions of leadership. Left not so disappointed with the actual topic, however. As far as CSM9 doing away with those titular positions, I interpret that as laziness. We'll see if their efforts are along the same lines, but I fully expect CSM9 to be almost invisible over the coming year. The CSM doing away with official positions is so dumb. The CSM needs to be ruled with an iron fist like the good old days of Chairman For Life Mittani. @CM - Mittens *is* still ruling the CSM. Didn't you bother to check who won the CSM9 elections? Who do you think most, if not all, of these players look to for leadership in the game (and metagame)? What we all want to know is if CSM8 is responsible for the new tooltips, which don't have an option to turn them off. Not that I noticed, but there were so many things being thrown at us that last couple of weeks that I might have missed them. There are some pretty hysterical ones (there's a tooltip for the close button...). Plus I heard tonight that they operate at Tidi speed, which strikes me as almost laughably absurd. Let's hope that was unintentional and will be fixed soon. So yeah, some work to be done there. AFAICT all the client animations operate at tidi speeds from what I can tell. The previous funniest example of this was opening and minimizing windows while in tidi. [Sigh] Thanks for reminding me of this, I've been trying to keep this out of my mind for the last year or so. Going on 5 years now and this is becoming something I loath to think about, because it just might end my Eve. I've been a lowsec player now for most of that time, and frankly I need something new, it's just time to move on. But the problem is to where? Too much scanning in WH's for me, and I love the idea of Sov... but then stuff like this. I don’t want to be a cog. I don’t want to quit my job to not be a cog. Even playing “solo” in lowsec I can matter. I can matter in fleets (piloting in small gangs), hell, I can matter in politics (I’ve caused some trouble between larger groups). But when you’ve got bored of lowsec and want more… well there just isn’t any. I remember when I first started playing I thought that 0.0 politics was like the greek city states fighting it out. Local politics effecting the larger sandbox. Gangs fighting tier neighbors, then befriending them, then stabbing them in the back. Everyone could matter. I was so excited. But in reality it’s just a handful of elites (with armies of forever anonymous F1 pushers) playing the space version of Axis and Allies with their few friends. Sure, there is the ever so slim possibility you could become one of the chosen few, but to do so requires you quit your job and play Eve full time. It’s just so depressing when you think about it. So yea, thanks for bringing it up.